You won't be disappointed in our #SantaBankoBaby Christmas Bar Menu filled with Santa's Snacks and Ice Cold Cocktails. Enjoy Merry Manhattan's and Classic Holiday Sliders to really add to the amazing ambience we have created unlike no other. We offer Hot Chocolate, Cinnamon Rolls, and Festive Cocktails that will even make the Grinch Happy every Holiday Season. "Young, hip vibe with fabulously fresh take on traditional Mexican cuisine. Finishing off the meal with a beautiful plate of churros. Decorated for Christmas to the max! Lovin' it! But honestly ,the food was the star. Don't miss this place." Win Over $2,000 in Gift Certificates, Cash & Prizes! Plus, your chance to Win a StayCation at Hilton West Palm Beach. Sounds by DJ Gabriel in Currency Lounge. DJ Andres & Knightly on the Roof at Cielo Sky Lounge. 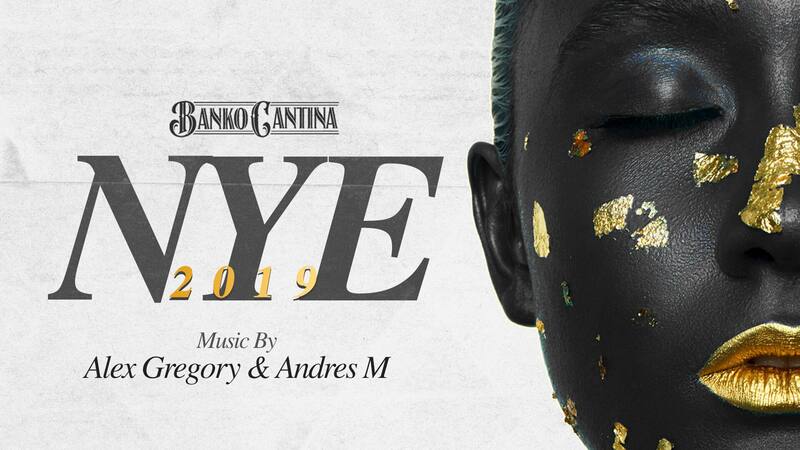 Make your Reservations Now by Texting 561.255.9380 or Email BrianE@BankoCantina.com because we will Sell Out! Doors Open at 4 pm. Rooftop Opens 7 pm. Love is in the Air. 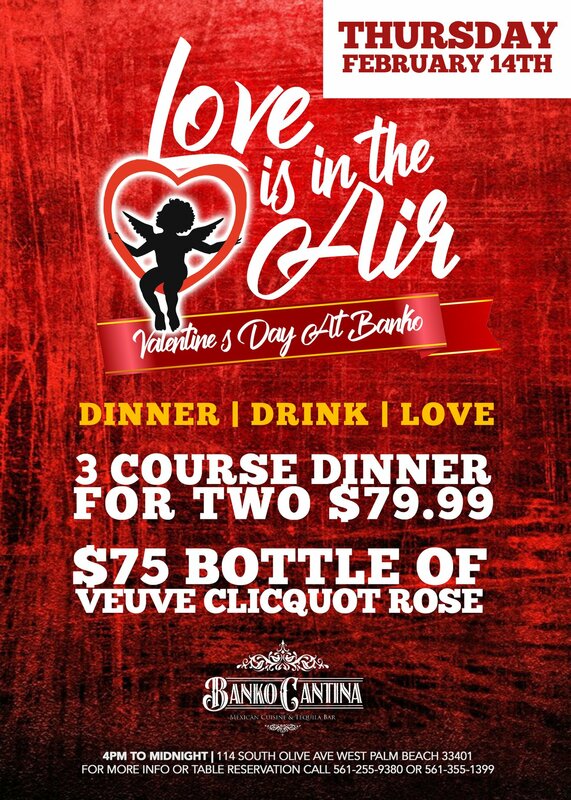 Celebrate Valentine's Day at Banko Cantina. Make a Reservation now before we Sell Out. Banko is offering a 3 Course Dinner for Two for only $79.99. Add a bottle of Veuve Clicquot Rose Champagne for only $75. 4 PM - Midnight. Reservations Recommended. 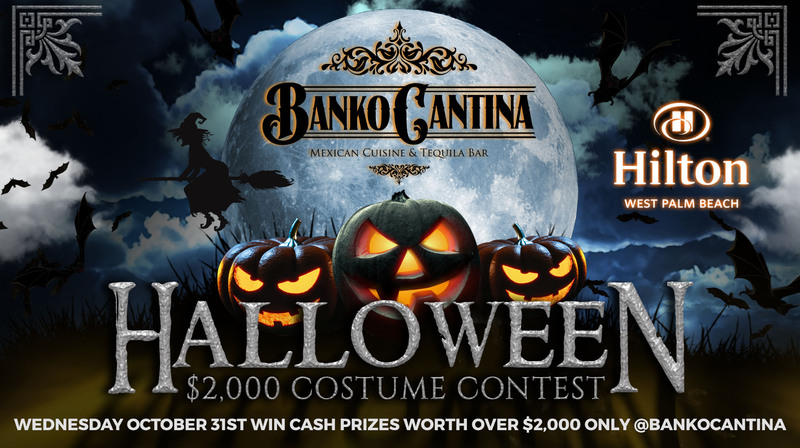 Please email BrianE@BankoCantina.com for any other questions. Didn't get to celebrate Valentine's Day with your Significant Other? 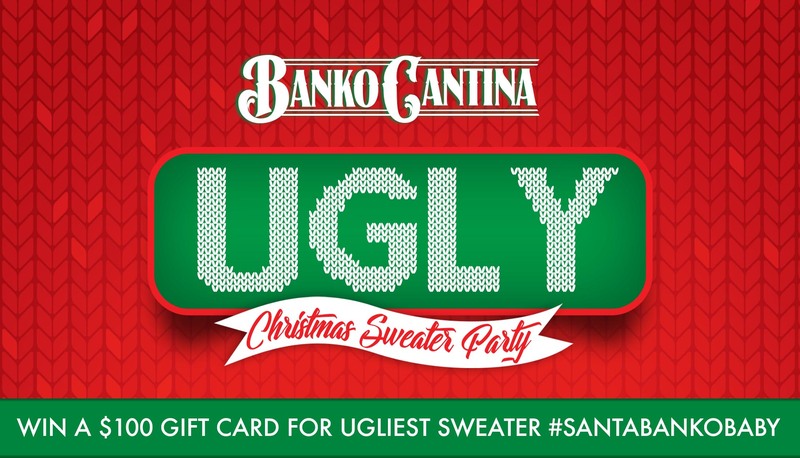 Join Banko Cantina for Dinner Show Fridays. Special Guest Scott Ringersen. Show starts at 7 PM. Reservations Recommended. Text 561.255.9380 to book your table now. 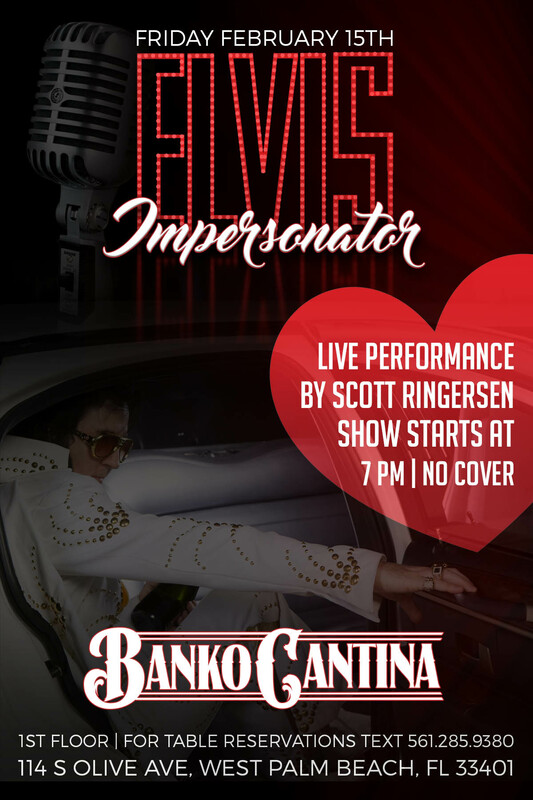 Join Banko Cantina for Dinner Show Fridays February 1st and 22nd. Show starts at 8 PM. Reservations Recommended. Text 561.255.9380 to book your table now. $29.99 Dinner Option includes Small Plate, Entree and Dessert. 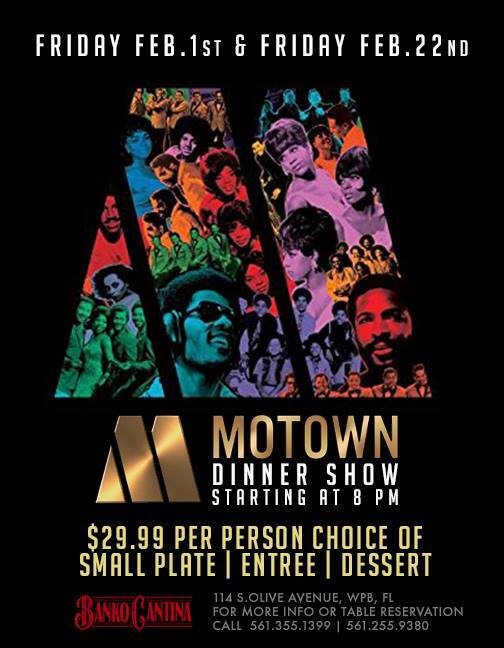 This Sounds of MoTown Dinner Show will be one you don't want to miss.